1879 Warren Map of the Pacific States: Washinton, California, Texas, etc. Map of the Pacific States and Territories with a part of the Central and Southern States. 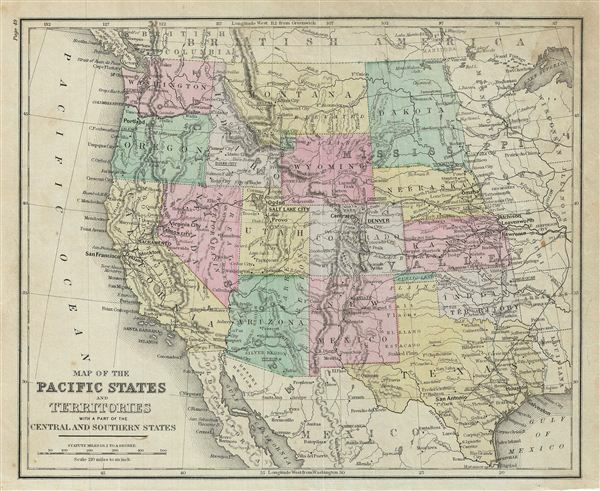 This is an example of David M. Warren's 1879 map of the Pacific, central and southern states of the United States. The map covers the states of Washington, Montana, Dakota, Nebraska, Wyoming, Oregon, Indiana, California, Nevada, Arizona, Mexico, Texas, Kansas, Colorado and Utah. Part of Oklahoma is here marked as 'Indian Territory' and 'Public Land.' The Yellowstone National Park is highlighted. The Colorado Gold Region, which was first discovered in 1858, as well as the Gold Region in California and the Gold and Silver Regions in Arizona is well labeled. Throughout, the map identifies various railroads, cities, towns, rivers, islands, mountain passes and an assortment of additional topographical details. The map is color coded according to regional and political boundaries with elevation rendered by hachure. Issued as page 49 in the 1879 edition of Warren's Common-School Geography. Very good. Even overall toning. Text on verso. Some foxing.